Take the assessment yourself to make your response the answer key. After you have enabled it, choose “Grade Assignment” and follow the instructions it prompts you with making sure you select your answers as the answer key. Student responses will be graded based on the key and provide you with percentages and frequently missed questions. 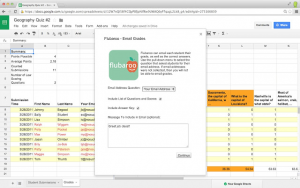 Share the grades response sheet or provide a screenshot of your grades in Flubaroo.